If you want to change the default template and skin for your Spaces application, the first step is to create a new template and skin based on the OOTB template which looks similar to the design you want, and apply them to the Spaces application. In our example we want to have the menu on the top of the page so we created a new template based on the ‘WebCenter Spaces Top Navigation’ template. 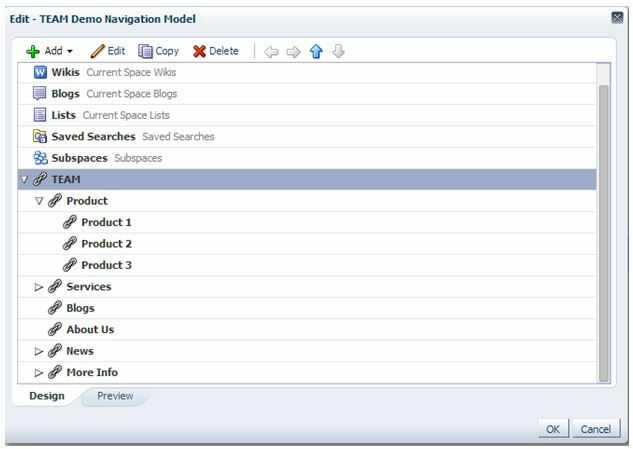 You can create a new template and skin from the ‘Resources’ tab (Administration-> Spaces-> select Space and select ‘Edit space’). We need to change the template because the logo icon has to be on the left side of the menu. Now you can easy see the structure of the template and decide what to change. Using jDeveloper you can see the <af:decorativeBox id =‘db1’ > component contains the Global navigation menu and the logo. The component with id set to ‘pt_pgl4’ holds the Top navigation menu. We decided to replace decorativeBox component with panelGroupLayout component. Next we want to change the menus background color. The background color for the global menu should be in white. we don’t see the background color anymore on the top of the page . When you are checking out the styles for some components, you will not see the name of the component but some code, for example, .x106 (the skin is compressed). You can apply changes using those compressed names or if you know, for example, which component is used you can try with af|commandLink. You could also open the page fragment in jdeveloper and check which component and style class is used and use it in your skin to add changes. We also want to add some new pages, so we are going to change the navigation model. We currently don’t see any sub-menus, so next we are going to change the menu component in our template. 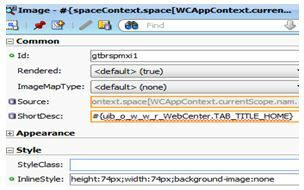 Using the browser Developer Tool, you can see the menu is placed in the component with id ‘T:spcNavPanel’. 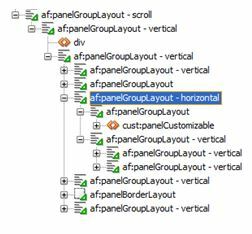 Search for this component in your template file and you can see a region (task-flow) is used to display the menu. Next, we want to display the ‘More Info’ menu at the bottom. 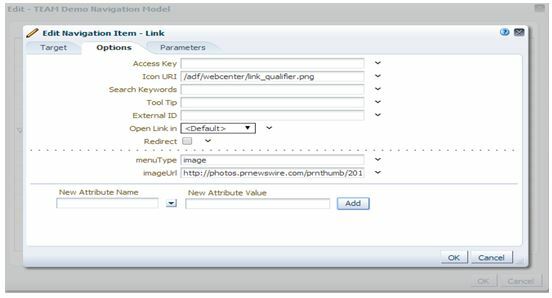 Create a new link and add attribute ‘menuType’ with value set to ‘image’. Finally, we want the submenu to cover the entire page. We are going to clone the submenu in a mouse over action with this container. You also need to add an event to clear the container when exiting from the submenu. Those are the basic steps to change the template and skin of your Portal application. Using a browser Developer Tool enables you to discover which component has to be changed or what to change in your skin. 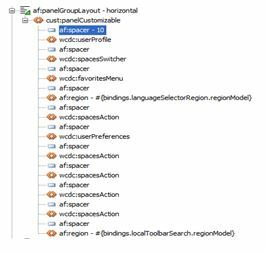 This entry was posted on Tuesday, April 22nd, 2014 at 10:19 am and is filed under ecm, Oracle, Portal, WebCenter Portal, WebCenter Spaces. You can follow any responses to this entry through the RSS 2.0 feed. You can leave a response, or trackback from your own site.